Concrete may not be the first wall material to choose for a house. However, the board formed concrete walls can be beautiful, with a unique aesthetic suitable for modern properties. Concrete walls also provide strength and durability, and you can combine them with other materials to create personalized designs. Depending on the construction, concrete can look beautiful in its unique way. Read this guide before deciding about installing such walls for your home. “Board formed”, as the name implies, refers to concrete that has patterns created by wooden boards stuck on its surface. It originated from a practice of holding wet concrete in place with wooden structure until it hardens, resulting in patterns on the surface of the concrete. Nowadays, board formed concrete walls refer to a concrete surface that is intentionally decorated using wooden planks. In this method, the builders create unique patterns on the wet concrete using wooden planks. The results are unique patterns that retain the wood’s subtle grain patterns and border lines. The patterns can be horizontal, vertical, or full of smaller details depending on the design plan. 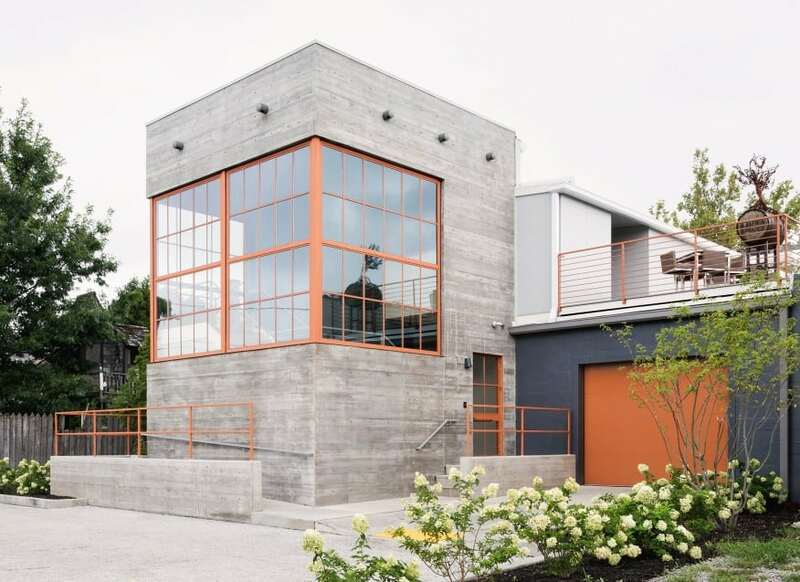 Bare concrete has a harsh, “industrial” look, which is not so ideal to complement a personal home. Concrete patterning will soften the entire look, creating a unique decorative element that stays subtle. Concrete is perfect to complement various modern home designs. You can use it to create an industrial, minimalist, or modern farmhouse look. Concrete’s neutral shade is also perfect as a background for any decorations or furniture you like. Concrete is a strong material that can withstand wind, storm, and snow. It is perfect if you live in an area with extreme weather pattern. Concrete is also durable and can last for years. Concrete is able to retain temperature, allowing you to feel comfortable amidst extreme outdoor temperature. The walls can retain warmth from your fireplace or heater longer during winter. Also, if you turn on the AC during summer, the material will retain the cool temperature longer. Board patterns on concrete walls are subtle, perfect as decorations for practical homeowners. Your patterned concrete house will look great next to a flower garden, manicured lawn, or vegetable beds. Use this concrete wall as an accent wall in your house. Choose smooth walls with solid color as the “main”, and board formed a wall as the focal point. Place a fireplace, entertainment center, or large artwork on this wall. Want to create a modern look? Combine board formed concrete walls that have subtle patterns with large glass panel windows. For the interior, you can install wooden floor to complete these two contrasting materials. Protect your house from mudslide and soil damage by building board formed retaining wall in your backyard. This wall will look great with vegetable gardens or flower beds. You can also create double retaining walls, with fixed planters between the two walls. Board formed concrete surface may look grey and “cold”, but you can get creative with the designs of other aspects in your property. When looking for contractor or builder service, make sure to find workers that have experiences with concrete buildings. Emphasize your goal to have board formed concrete as a part of your new home. Once you get the crew and project leader, discuss the final look you want to achieve. Make sure everyone is on board about the design. Ask the builder team if the cost you pay includes a mock-up. This is a concrete board that serves as a “sample” for the project target. You and the crew can recreate the design plan until you feel satisfied. The crew later can apply the design to the actual walls. Board formed concrete walls need formworks to create the patterns. This means that the building process is slower than normal walls. All the formworks must be screwed to hold them in place, and they need to be in the right position. When connecting wooden boards, make sure to cover the gaps with silicone or other similar materials (experienced crew usually understands it). This is to prevent the concrete mixture to “bleed” from the gaps and ruin the effect. Ideally, you must use rich cement mixture for board formed concrete. The high cement ratio will create more visible board patterns, without honeycombing the structure. Your concrete surface must also be free of aggregate to create the best effect. Board formed concrete cost is a little more expensive than regular concrete wall construction, since you need to pay for additional labor, wooden structure, the base, and other common aspects. Depending on where you live, expect to pay between USD30 and USD50 per square foot to create board formed concrete walls. You must also consider other costs, especially the labor pay. Some companies may charge extra high for “decorative” works (others even don’t do such task). When doing a cost comparison, ask for all project costs, from materials to workers’ costs. Forming patterns using wooden boards is a way to “decorate” concrete walls without being excessive. This design will soften the look, allowing you to have concrete walls for your home and get the benefits. Since board formed concrete requires specific tasks during the construction project, make sure to discuss the details with your crew or contractor before paying for anything.